Popping out early, NASA astronauts Drew Feustel and Ricky Arnold quickly swapped the positions of two spare ammonia pumps that are part of the space station's critical cooling system. One pump got too cold because of a power shutdown 17 years ago and is called Frosty; flight controllers plan to test it in the coming days to see if it still works. The other, a failed unit dubbed Leaky, spewed out ammonia five years ago. Frosty took Leaky's spot on a robot-arm mechanism, while Leaky was moved to a long-term storage platform. Ammonia coolant is toxic, and Mission Control repeatedly warned the spacewalkers to be careful of any leaks. 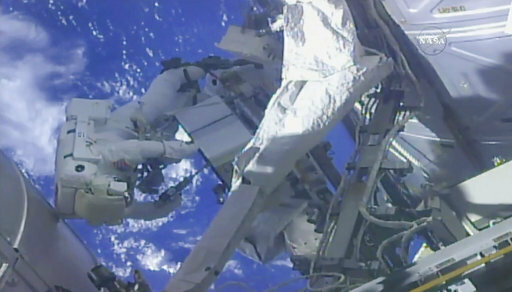 A brand new spare pump arrived at the space station last month. This fresh pump is named Motley since it's comprised of a variety of spare parts.